Spring has arrived and Summer is just around the corner. If your heating system is in need of major repair or replacement, this is the time for you to get that done. If your furnace vents into an unlined masonry chimney, then you should install a chimney liner. If your chimney already has a liner, but it’s deteriorated, then you should replace it with a new one. Chimney liners serve three primary functions according to the Chimney Safety Institute of America. The liner protects the house from heat transfer to combustibles. Liners protect the masonry from the corrosive byproducts of combustion. Liners provide a correctly sized flue for optimum efficiency of appliances. Do your existing natural-drafing furnace and water heater share a chimney? If you replace the furnace with a sealed-combustion furnace, the your chimney will likely be oversized for the water heater alone. The “orphaned” water heater may need a chimney liner because it may not draft correctly into chimney that is too large. Use a correctly sized Type-B vent, a flexible or rigid stainless-steel liner, or a flexible aluminum liner to size the chimney correctly for the water heater. 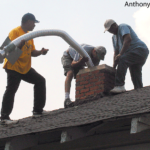 A crew installs a metal chimney liner into a masonry chimney. Flexible liners require careful installation to avoid a low spot at the bottom, where the liner turns a right angle to pass through the wall of the chimney. Comply with the manufacturer’s instructions, which usually require stretching the liner and fastening it securely at both ends, to prevent the liner from sagging and creating a low spot. Flexible liners are easily damaged by falling masonry debris inside a deteriorating chimney. Use B-vent, L-vent, or single-wall stainless steel pipe instead of a flexible liner when the chimney is significantly deteriorated. To minimize condensation, insulate the flexible liner — especially when installed in exterior chimneys. Consider fiberglass-insulation jackets or perlite, if the manufacturer’s instructions allow. Wood-stove chimney liners must be insulated stainless steel. Sizing flexible chimney liners correctly is very important. Oversizing is common and can stop the furnace from drafting correctly, which can lead to condensation and corrosion. The liner manufacturers include vent-sizing tables in their specifications. Liners should display a label from a testing lab like Underwriters Laboratories (UL). Older masonry chimneys can be structural hazards. Consider reinforcing a deteriorated chimney by re-pointing the masonry joints or parging the surface with reinforced plaster. A double-wall horizontal sidewall vent, equipped with a barometric draft control and a power venter mounted on the exterior wall. Maintain a 4-foot clearance between the ground and the vent’s termination if you live where it snows. A new heating unit, equipped with a power burner, or a horizontal or vertical venting draft inducer. A new manufactured metal venting system. A new sealed-combustion heating unit, equipped with a combustion-air source from outdoors. Take care of these issues now, while the weather is friendly. Don’t wait until Fall or Winter when you need the furnace to keep your house warm. For more information on HVAC systems, please see our following products.